I buy this cookbook several years ago which enchants me as I see a very popular recipe therein. 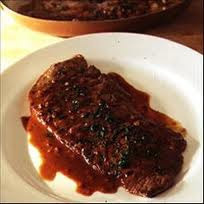 Called Steak Diane, it is all the rage in New York City restaurants back in the 1950’s and 60’s. This beefsteak makes a lovely entree but what sets it apart from other steaks is its distinct preparation technique. Like the popular Crepes Suzette, Steak Diane is a flambé dish prepared tableside on a trolley (called a gueridon). The theatrics of the tableside cooking coupled with the flaming cognac makes Steak Diane a dining sensation. The flambé process offers a captivating demonstration for onlooking diners, but aside from that charming amusement it also improves the taste, given that ignited alcohol intensifies the sauce’s flavour. It does this through a chemical process called carmelization, which causes the sugars to undergo complex changes, whilst for our purposes results in exponentially more deliciousness. Alcohol boils in a pan at 212F but igniting it directly raises the temperature to 300F +, which in turn elevates the flavour aspect to a more celestial dimension. All right, enough already. If you want to add some excitement to a dinner party you could serve this retro dish. Not only will your guests be enthralled by the flambéing, which they probably haven’t experienced for awhile, they will also savour the taste of this elegantly finished beefsteak. Flambeing is not complicated, but please observe basic safety considerations just as you would when lighting a fireplace or whatever. You don’t want to meet your local fire department by accident, ne c’est pas? Bring the beef to room temperature. Season the beef medallions on both sides with the salt and pepper. Let sit 5 minutes prior to cooking. Melt the butter/oil in a large skillet over medium-high heat. Add the meat and sear for 45 seconds on the first side. Turn and cook for 45 seconds on the second side. Lower heat a little to prevent scorching. Add the shallots and garlic to the side of the pan and cook, stirring, for 20 seconds. Add the mushrooms and cook, stirring, until soft, 2 minutes. Place the meat on a plate and cover to keep warm. Depending on how you want your steak cooked, you can use your hand to judge doneness. Take your non-dominant hand and press your index finger to your thumb. Touch with the other hand. That is how the meat should feel for cooked rare. Thumb and middle finger for medium rare, thumb and ring finger for medium and thumb and little finger for well done. Off heat, tilt the pan towards you and add the brandy. Tip the pan away from yourself and ignite the brandy with a match. When the flame has burned out, add the mustard and cream. Mix thoroughly and cook, stirring, for 1 minute. Add the beef broth and simmer for 1 minute. Add the Worcestershire sauce and stir to combine. Return the meat plus any accumulated juices to the pan and turn the meat to coat with the sauce. There you have it. If it’s okay to play with matches you can make a spellbinding beef presentation that delights the eyes and the taste buds one after the other. Steak Diane goes well with a simple sautéed potato dish or a rice pilaf. Just remember to observe caution with that open flame. HEY NICKI: But yeah, this would be popular if offered. Not realy a rebel, tried to post last week but had trouble with computer. Am in central Florida visiting daughter's family and am contributing broccoli-cauliflower au gratin for Thanksgiving day. I was right. My mouth was watering from the beginning. TORVIEW: Yes, a wonderful beefsteak dish. JOLENE: It is THAT good. NATURAL ONE: Happy thanksgiving to you. This looks and sounds so delicious. I'm not a big steak fan, but this one I could learn to like....but I might wait awhile until the burns we have heal at least a little. Thanks for checking out my posts. This looks fabulous! Hope you had a wonderful Thanksgiving meal too. We added a really delicious creamy wild rice soup to the menu this year... I am going to post it on my blog next week-I'll let you know as it is definitely a keeper ! KATHY: Thanks for calling, yours and his burns will be healed in a few more days. I've had beaucoup kitchen accidents, you cannot be too careful with hot5 things, particularly fats. JOYCE: Creamy wild rice soup sounds very good, last soup I made recently was cauliflower with a touch of allspice. SIMMY: We did, thanks. Steak Diane used to be very popular and then fell out of fashion. But it is a terrific dish. I can't wait to make this recipe. It sounds delicious! Beautiful sky with pinkish tones and those pretty orange tree with a photo is very poetic. Happy weekend. Flambe certainly looks impressive . . . not sure I'd want to try it, though, what with all the flames. :P Thanks for the recipe, though! MAEVE: You will love this when you do. Thank You. LEOVI: Thank You for calling, happy weekend to you. THE GOLDEN EAGLE: Observing normal fire safety precautions, Steak Diane is simple and easy and safe. But maybe you could get a friend to prepare it. Either way, Thank's for calling. I love these old school dishes that have there own name. It maybe that not everyone was cooking, but the ones who did sure took it seriously. Nice post! Oh my gosh! I didn't realise Steak Diane was meant to be a flambé dish! Ah, the good ole days when we had performances at the restaurant tables. I've heard of it but have never tried it. But that picture above makes my mouth water. I bet my hubs would love that! STEPHANIE: Thank You, I do too. LYNDA R.: You're right, it was quite a sight. SYLVIA: Safety first Sylvia, good idea. SARAH: Thank You, I totally agree. ALEXIS AKA: If he likes beef he will love this. ELIZABETH: Thank You and welcome.